The blogging community will certainly have to re-strategize on tools that help in distribution of published content as a popular name will be shutting it doors. I am talking about Twitterfeed,A RSS (Really Simple Syndication) system; a technology that is being used by millions of web users including bloggers around the world to keep their social network channels updated from their blog. In recent times, social network channel like twitter and facebook have been flooded with links of blog posts leading to some calling such channels dumping grounds. It begins with synchronizing your social account with twitterfeed and at intervals it publishes latest content to connected accounts such as Twitter account for a blog. 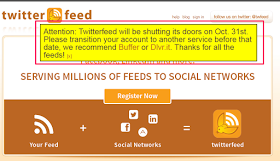 As it stands, there will be a transfer to other providers who are bit conscious about the number of account that can be connected unlike the free and unlimited TwitterFeed that will be shutting its doors on October 31st, 2016. As we prepare to migrate, Do you know other efficient alternatives to TwitterFeed? We would like to hear from you.